Hey guys! This year, I have developed a relationship with night creams. I love a good night cream because they're thicker, richer and super hydrating, which is fantastic, especially for the Winter weather. They work best at night because skin is at its most receptive, leaving skin so plump, hydrated, soft and radiant, compared to an everyday moisturiser. Also this year, I came across the Boot's Botanics range and fell in love. It's a fantastic skin care range, for a great price and it is (in some products) mostly organic and eco-friendly! Need I say more? The consistency is really nice, thick, smooth and creamy. The Botanics night cream promises brighter and smoother skin by morning. The key ingredients in this are Natural AHAs- The natural AHA's from the Hibiscus flower act as mild exfoliators, leaving skin smoother and softer. Hyaluronic Acid- Proven to boost moisture levels in the skin. Hibiscus- To brighten the skin. Shea Butter- To soften the skin. 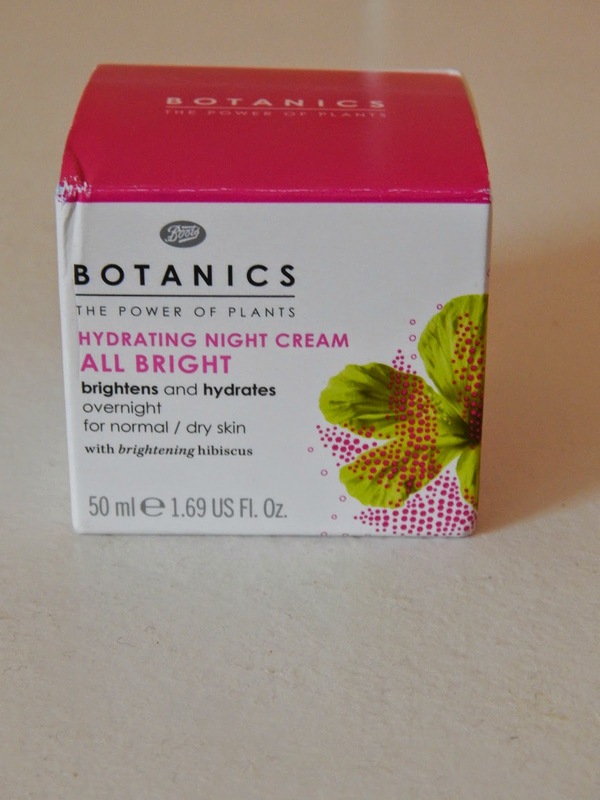 The Botanics night cream left my skin feeling hydrated and softer. It also looked more radiant and brighter, fantastic! Especially as Winter dulls my skin. I use this every night after using toner and massage it into my skin. This is best for normal/dry skin. I have combination skin and it's been great for my dry patches! I love Botanics especially because it is an eco-friendly brand! A great deal of products in the range are mostly organic. There are no parabens, it's people tested and the (cute) packaging is 100% recyclable. The Botanics All Bright night cream cost me a fantastic €3.49 for 50ml, got to love half price! I give this night cream a 10/10 and I would 100% buy it again! Have you tried this night cream what did you think? What do you think of Boot's Botanics range? Let me know below! Ive never heard of this brand before, but it sounds like some good stuff!